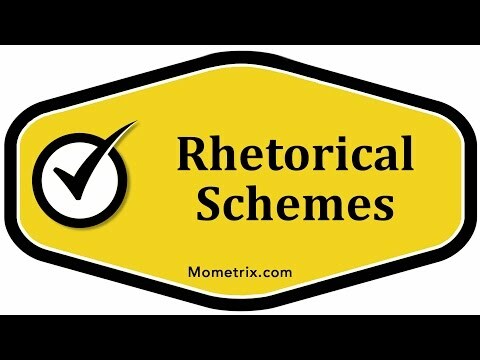 Rhetorical schemes are strategies used to emphasize, to draw analogies, and engage the reader. The following are some examples of rhetorical schemes: Parallelism, in which the structure is the same for several sentences; Repetition, in which the author repeats a word to emphasize it, or cause the reader to analyze the appropriateness of the word; as well as Antithesis, in which contrary ideas are presented within a balanced sentence. Authors use rhetorical schemes to emphasize, draw angles, and engage the reader. Some common rhetorical schemes we have are parallelism, repetition, and antithesis. Rhetorical schemes are just devices used to make your right your writing stronger and more interesting. These are just a few of many different rhetorical schemes. If you are interested in more ideas, you can always research and find other rhetorical schemes, so you could make your writing stronger. Parallelism is when several sentences are given the same grammatical structure. An example would be: “Hector went to the store. He went to the bank. He went to the gym.” The author suggests the dullness of these activities. That parallel structure says that it’s the same thing happening over and over again. It’s really dull. It’s really boring. He went to the store. He went to the bank. He went to the gym. He was just playing out the monotony of his day. It was dull, and this grammatical structure is supposed to echo the dullness of the story that’s being told. Repetition is another example of a rhetorical scene. Repetition is when he used the same word several times quickly. The author does this for different reasons. Let’s look at an example and we’ll discuss those reasons. “They called him a slave, he thought of himself as a slave, and his prospects were no better than those of a slave.” This mimics the plodding, hopeless nature of slavery. Think about the way that sounds. It sounds like he’s plodding along. They called him a slave, and he thought of himself as a slave, and his prospects were no better than those of a slave. It’s plodding in the sense that it’s hopeless. You hear the word “slave” over and over again, and it causes the reader to focus on that word “slave” and consider whether it is really appropriate. Those are two reasons that a writer may use repetition. It may mimic a certain nature and make you think about that, or it could cause the reader to focus on that word and consider whether it’s appropriate or whether it’s being used as a literary device. Is this person really a slave, or is it someone that they’re just calling a slave as an exaggeration because of the way he’s being treated or the way that he’s perceived? We really don’t know based on this one sentence whether this word is appropriate or not. We would have to see the rest of the paragraph, but it definitely does give us a plodding, hopeless feeling to this sentence. The last rhetorical scheme we’re going to discuss is the antithesis, which is using contrary ideas expressed in a balanced sentence. An example would be: “One small step for a man, one giant leap for mankind.” This is the famous quote said after we took our first step on the moon. Putting man on the moon was a giant leap for all mankind, but it was just one small step. He took one small step onto the moon, and that one small step counted as a giant leap for all mankind. You’ve got those contrary ideas of a small step and a giant leap expressed in a balanced sentence. You understand what he means. One small step for man one giant leap for mankind. Being able to step foot on the moon was a huge leap for mankind, even if it was just a small step literally. This is an example of antithesis. In your writing, there are several rhetorical schemes that you can use to make your writing stronger and more engaging to the reader.